» Covenant Books and Coffee: You can't get bored with a soup menu that changes daily. Over 30 days you may be able to sample 30 different offerings, from corn and green chili chowder (Saturday) to red pepper and cheddar (April 5). At 1142 12th Ave. Call 732-4600. » Fook Lam: Warm up over a X.O. 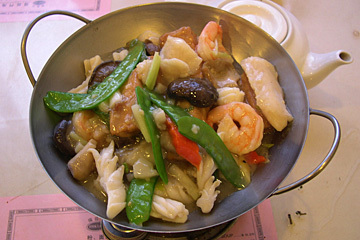 seafood casserole with tofu, calamari, shrimp, sea bass, scallops and snow peas, pictured. For $10.95, it easily feeds two. If you don't eat seafood, chicken and casseroles are also available. At Chinatown Cultural Plaza, 100 N. Beretania St. Call 523-9168. » Buk Chang Dong Soon Do Bu: On chilly nights, warm up with chili-filled soondobu, or tofu soup with vegetables and shellfish, $10.40. At 1518 Makaloa St. B, 953-2299. Cash only. No Easter party is complete without the egg dying, egg hunt, egg salad sandwiches, chocolate bunny, marshmallow bunnies -- or the annual portrait with the Easter Bunny gracing the end table. So wear your holiday pastels and a big smile, then hop on down to the local mall for pictures with the Easter Bunny. The major malls on Oahu begin picture duty this weekend and continue through April 15 and 16. See more holiday events in our Easter calendar on Page 10. Looking for a relaxing atmosphere with live music, food and drinks? Shanghai Bistro has it all. "Broadway at the Shanghai Bistro" features the piano stylings of Don Conover and vocalist/cabaret singer Shari Lynn. Conover starts the evening entertainment at 7:30 p.m., with Lynn taking the stage at 8 p.m. Dinner guests get a fantastic show with their meal or, for something lighter, reserve a seat in the lounge area. The $20 cover includes a pupu platter and a drink. You have to hurry to see Lynn, though. Her last two performances are Friday and Sunday. Rex Nockengust will be taking Lynn's spot from April 7. Call 955-8668.